I offer Cognitive Behaviour Therapy (CBT) for common mental health problems. Most often I see people who are experiencing problems with anxiety, depression or low mood, panic, phobias, sleep problems, obsessions and compulsions (OCD), anger problems or stress. Stress Control classes were developed by Dr Jim White from the Glasgow Steps team. The course is designed to be delivered as a series of public lectures, and in Glasgow I understand that they have been able to get upwards of 100 attendees. The style of the Stress Control classes does not encourage questions from participants, and allows attendees to remain completely anonymous. The course runs over 6 weeks as a free evening class based on a Cognitive Behaviour Therapy (CBT) model. The presentations are often done by Clinical Psychology staff, a Clinical Associate in Applied Psychology, or an Assistant Psychologist, for example. Participants are usually provided with a folder containing a printed workbook and relaxation CD. This series has been adopted in other areas, and when I was working in NHS Lothian (Edinburgh) we relaunched the service in East Lothian. At the time I worked on the branding and marketing of the course and initiated development of the NHS Lothian webpage to advise individuals as to where and when future courses would be available in Edinburgh, East Lothian, West Lothian and Midlothian. As part of a Cognitive Behaviour Therapy (CBT) approach, it is quite usual for a therapist to suggest homework exercises for a client to undertake between sessions. In order to support some of these you can get smart phone app – to remind you, make it more fun or interesting, and to make sure that you are doing it right. There are apps that can help you with relaxation exercises, suggest tips on overcoming stress or sleep problems, and those that help you to record and challenge thought errors or unhelpful thoughts. It can be difficult choosing which of these apps are best or most appropriate. Some of them may not represent strategies correctly, which may render the advice or support ineffective or confusing. It’s my intention to review a few of the apps that I’ve come across for the iPhone / iOS platform here on my blog. If you would like me to take a look at any that you’re thinking of buying – email me! Equally, it would be great to hear from any developers who have got apps in the app store, or in development. Perhaps I could interview you, or we could work together on something in the future! A quote from Chris Williams (2008), taken from the Good practice guidance on the use of self-help materials within Increasing Access to Psychological Therapies (IAPT) services. Set aside a time and place to work on your project everyday. Don’t drink alcohol or nibble while working on your plan. Tea, coffee or juice are OK though. Get energised before sitting down to work. Anything that uses your muscles for a couple of minutes is OK.
Go through it over and over till you know it by heart. Write notes and comments. Think about what it’s saying. Make a plan and write it down, step by step. Be sure to make them small, simple steps that you will be able to do. Think about eating an elephant. You can do it if you take lots of little mouthfuls. You WILL get stuck from time to time, so work out what to do about it in advance. Your plan is like a new year resolution so don’t let it fade away. Check your progress every week. Get a lot of help. The more people know about your plan, the more help you’ll get and the more likely you are to succeed. Write yourself a letter from 10 years in the future – “Thanks for being strong all those years ago”. Pepper your fridge with post-its. Write I CAN DO IT on the mirror. Imagine you are your own best friend and give yourself some good advice. Think like an athlete and get coaching and support from anywhere and everywhere you can. Plan your support sessions in advance – know what you want to say or write to a friend, a group, a counsellor or a doctor. 15.Write an agenda and use it in support sessions. Words have meaning. Different words can have the same meaning, and the same word can have different meanings. Our individual perception and understanding of words is influenced, among other things, by our past experience and context. That is what this video from Everynone demonstrates so beautifully. Good communication is important. When someone uses certain words they tend to have a meaning in mind. It’s important to try to grasp that meaning, and not apply your own meaning to what they have said. Misunderstandings may be avoided. During my training we practised an exercise in which one person made a statement, and the next person had to repeat back a paraphrase of the statement, and then check with the first person as to whether what they had said was an accurate reflection and carried the same meaning. Active listening involves paying attention, being sensitive to meaning, demonstrating empathy, and taking the time. In the past I have worked within services which have been able to provide computerised Cognitive Behaviour Therapy (cCBT). I supported individuals who had completed the eight sessions of the ‘Beating the Blues‘ course for anxiety and depression. It’s my understanding, based on the recommendations of NICE guidelines, that this method of delivering Cognitive Behaviour Therapy (CBT) has been found to be both efficient and effective. Beating the Blues is an online, computerised programme for the treatment of depression and anxiety which uses Cognitive Behavioural Therapy (CBT). Whilst many areas do not have the infrastructure to deliver computerised psychological interventions of this sort, such treatments or training packages can now potentially be accessed by individuals from home. In order to increase the accessibility and availability of psychological therapies, it is my intention to offer my clients the option of having sessions of online Cognitive Behaviour Therapy (CBT) via Skype. There is an increasing trend towards providing psychological therapy services that are more convenient to access and more efficient to deliver. I believe that by offering CBT via Skype I will be able to help clients to access therapy quickly and have more regular sessions, which may contribute to the effectiveness of the treatment being delivered. A session of online CBT via Skype will be arranged in the same way as a face to face or telephone consultation. In order to arrange a session of CBT on Skype, clients should have their own account setup and be familiar with the use of Skype as a tool for online communications using either audio or video. I studied methods of delivering treatment for fear of flying (aero phobia) as part of my Masters dissertation. Specifically I was looking at the use of virtual reality technology . Encouraging a person to become increasingly familiar with a situation or experience which has caused them anxiety, fear or concern in the past, can help to alleviate that anxiety. This process is called exposure therapy (part of a Cognitive Behaviour Therapy (CBT) approach), and in the case of an anxious flier experiencing a fear of flying, it can be difficult or inconvenient to access suitable scenarios, potentially including access to an aircraft and regular flights. Fear of flying can be a complex issue, and it may be quite different depending on the person. A person may experience anxiety about the airport environment, particularly security or the boarding process, or there may be fear relating to the take-off, flight or landing phase of the journey. The actual flight itself may feel more manageable if the person comes to understand more about the ‘science of flight’, the detailed procedures involved in commercial flights, and the features of modern planes. However, there is little substitute for an anxious flier to actually become more confident sitting in the terminal, sitting on the plane, and experiencing a flight, despite the anxiety. Would you like to become a more confident flier? Would you like to overcome a fear of flying? Some of the big airlines in the UK offer courses, for example Virgin Atlantic’s ‘Flying without Fear’ course, or British Airways Fear of Flying course. You may have to wait until the next local course starts. If you would like a more individually tailored approach to address a fear of flying, without having to wait for a group to start, why not get in touch? Anxiety UK recently released a free iPhone app called ‘Stress Tips‘ (sponsored by Pfizer life). 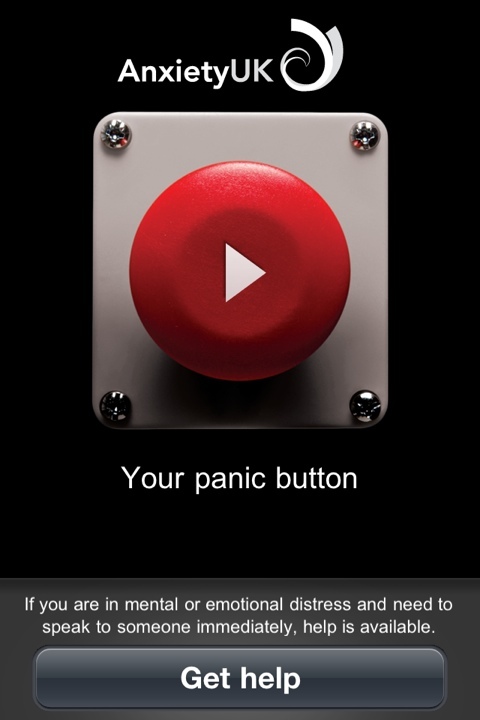 It’s a simple app with some good advice delivered through short audio messages which you can listen to by pressing the prominent on-screen ‘panic button’. The app has an occasional ‘donate now’ pop-up, and a helpful list of organisations to call if you are needing urgent help. The latter is accessed via a button on the main screen, and includes shortcuts to call NHS Direct, Samaritans, Anxiety UK helpline. The simplicity of this app appeals to me, although once you have listened to all of the recordings there’s not much more to explore. There is a nice collection of short personal audio messages by a diverse range of people – the quality is perfectly adequate but most of them sound like they were recorded off voicemail! It’s important to remember that everyone has there own preferred way of effectively dealing with stress. Cognitive Behaviour Therapy (CBT) is a a combined and complimentary approach which incorporates elements of Cognitive Therapy, which looks primarily at thoughts, and Behavioural Therapy, which focuses on actions. Cognitive Therapy aims to maintain rational and balanced thinking. In doing so, irrational thoughts, negative thoughts or biased thoughts are deliberately and systematically identified using a thought diary system. These thoughts are then carefully considered and processed or ‘challenged’ in order to evaluate how realistic, balanced and helpful they are. It may be possible to work out a more balanced thought to replace what is often called a ‘negative automatic thought’, ‘unhelpful thought’ or ‘thought error’. It is quite common for people to experience a bias in their thinking styles at one time or another. For example, when they are tired, irritable, worried, upset or feeling low. It is often when a persistent pattern begins to emerge that such thinking can start to have a negative impact. Stress management is a skill. Some people are good at it, and others could learn a thing or two. There may be steps that you can take to actively reduce stress, immediately or in the longer term. At the very least, most people can benefit from learning skills to cope with stress. There will be times in every person’s life when they experience stress – due to life events, at work at home or relating to friends or family members. Stress is almost unavoidable. It is important to make good use of the resources that you have available to you (both internal and external). For example, social support has a positive influence on our ability to cope under difficult circumstances. Could you benefit from discussing, exploring and honing your approach to dealing with stress?